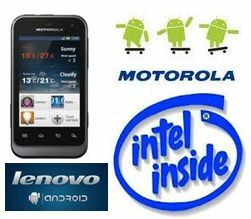 Intel's new processor designed for mobile devices will be used by Motorola Mobility and Lenovo in upcoming Android-based smartphones. The Medfield chip is designed to help Intel make headway in a sector dominated by processors based on designs by the UK firm Arm Holdings. The announcement was made at the Consumer Electronics Show (CES). The Motorola partnership is significant as Android's maker, Google, is in the process of taking over the phone maker.